Smart Thermostats - Broad River Electric Cooperative, Inc.
Save on your heating and cooling costs. Help your co-op hold down power rates. *Receive full reimbursement of your purchase after 36 months. Install an ecobee smart thermostat. Then, enjoy the convenience and control of adjusting your home’s temperature from anywhere, anytime. Half of the retail price! Your participation also helps lower your electric bill. The thermostat automatically adjusts when you’re not home and for a few degrees during peak periods. That helps hold down power costs for all our members. 1. Call or email us with any questions. 2. Complete and sign this participation agreement (direct pdf download). 3. Come by our Gaffney headquarters or Boiling Springs office to purchase the thermostat of your choice. Already have an ecobee smart thermostat? Great! You're eligible for a $50 bill credit. Contact us to find out more. Call 866-687-2667 or email us at info@broadriverelectric.com. (*) If a participant overrides 40-percent or fewer of the load control events during a 36-month period of connection, the member will be credited a full reimbursement of their original smart thermostat purchase on their ensuing bill. What is the Smart Thermostat program? Broad River Electric’s smart thermostat program gives members the opportunity to purchase an ecobee smart thermostat at a discounted rate. By participating in the program, members will agree to allow the cooperative to control the thermostat during peak periods. You must have an internet-connected, Wi-Fi enabled home. A smart thermostat is a programmable thermostat that connects to your home’s WIFI and gives you the ability to adjust your thermostat setting to fit your schedule and save energy. 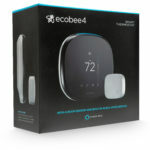 Broad River Electric members can purchase the ecobee 3 Lite and/or the ecobee 4 smart thermostats. Both have a digital, touchscreen displays and both can be controlled and scheduled using a computer or device (phone or tablet). 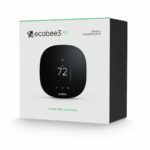 The ecobee 3 lite can be purchased for $85, which is half the normal retail price. The ecobee 4 can be purchased for $145, a savings of over $100 as compared to retail. What is the difference between the ecobee 3 lite and the ecobee 4? The ecobee 4 has Amazon Alexa built in. It is voice activated and has many of the features that come with Amazon Echo devices. The ecobee 4 also comes with an added room sensor to provide more effective cooling and heating. What if I already have one of these thermostats? Great! Provide your serial number and sign the agreement and we’ll give you a $50 credit on your bill. How does a smart thermostat help reduce my energy use? The ability to schedule your thermostat settings or to adjust them remotely can help avoid heating and cooling your home at unnecessary levels when no one is there. Based on a 2013 analysis, ecobee customers saved up to 23-percent on their heating and cooling costs. How will the cooperative control my thermostat? About 5-6 times per month, the thermostat will be adjusted remotely based on system-wide peak periods. What if I don’t want the cooperative to control my thermostat? You’ll be notified of control during peak times on the device’s display with an option to override. You can override control up to 40-percent of the time. If you were to exceed 40-percent, the cooperative would have the option to retain $50 as a charge on your bill. (*) You would also not be eligible to receive a full reimbursement of your purchase after 36-months of connection. Why does Broad River Electric want to control my thermostat? When the cooperative purchases power, energy at those peak hours is more expensive. The more we can cut down on how much energy is used during those periods, the lower our power bill will be. We will use that savings to hold down costs for our members.